The movie is based on the true story of Coach Bob Ladouceur who led the football team of De La Salle High School located in northern California to the most wins in history. I was thrilled to see Jim Caviezel (Passion of the Christ and TV’s Person of Interest) plays the coach, Laura Dern plays his wife, and Michael Chiklis plays his coaching partner of more than 30 years. Although the movie is not a ‘faith-based’ movie, it is about how the faith of these young men and the ones who lead them are challenged and held accountable to give their perfect effort. Their perfect effort in practice, on the field, and especially in life. AND how they are better together. The movie is written well to include the remarkable moments in the lives of the players and their families. They walk onto the field to play, holding hands, two by two to show their love for one another…and wig out the opposing team. The players are given opportunities to share what’s going on in their lives and how they pledge to support the team in all they are with great transparency the evening before the games. They share the challenges and goals each player has set for himself, written on an index card, and hands the index card to another player, to be read aloud, and for accountability. These scenes offer great examples of healthy small group. Although all the game scenes rock this southern gal’s world with fantastic photography and sound, my favorite part of the film is when the coach takes the team to spend the day at the local VA hospital. When a football player paces a veteran running on a treadmill with prosthetic legs, the energy in the theater is palpable. I could hear the audience around me shifting in their seats to lean forward. When a football player gives a wounded warrior a bath and the most egotistical of the players has a run-in with a urine bag, the laughter is big and real. With my limited vocabulary, I think the movie was great. I really enjoyed it. I’ll be talking about it when it comes to theaters on August 22nd. I’ll be telling Mamas and Dads to take their kids. I’ll be throwing some footballs in our CLUB345 to share that it’s a great movie to see. And I’ll be hanging up some posters on a few bulletin boards thro ughout the church to promote this really good family movie. It’s clean, courageous, inspiring, and a great film for teams, youth groups, teachers, coaches, parents, tweeners, everyone. You’ll laugh, you’ll cry, you’ll feel proud and there’s never a dull moment. If you really pay attention to the coaching team along the sidelines, you’ll see cameo appearances of the ‘real’ Coach Lad. There were even a couple of cameos of LSU’s head coach, Les Miles, in the opening game scenes. I was downright giddy! “Winning is just a way of keeping score for the days when opportunity and perfect effort meet. …..Winning a lot of football games is doable. Teaching kids there’s more to life? 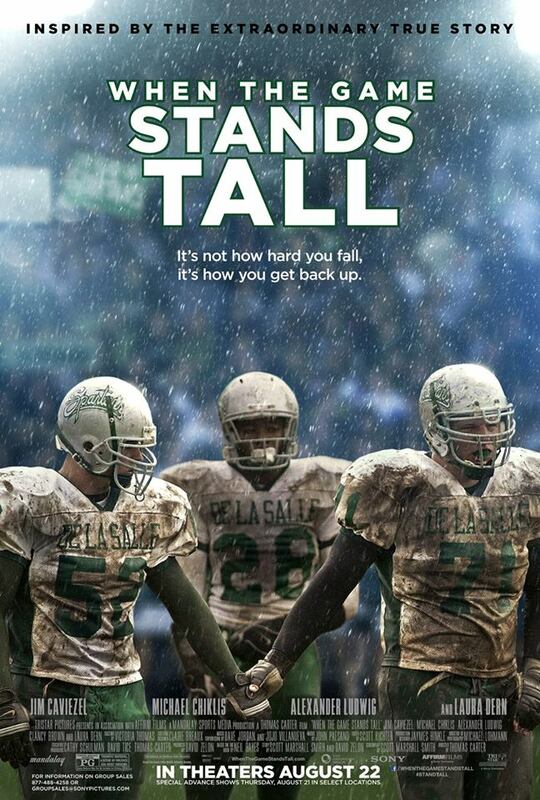 That’s hard.“- Coach Bob Lad, from the movie When the Game Stands Tall. 1. Watching my rising 6th graders take on leadership roles they’ve been chomping at the bit to do since last year. If I’ve done my job well over the last sever al years, they know where everything is in the storage closets because I’ve sent them there often enough to help gather supplies. 3. 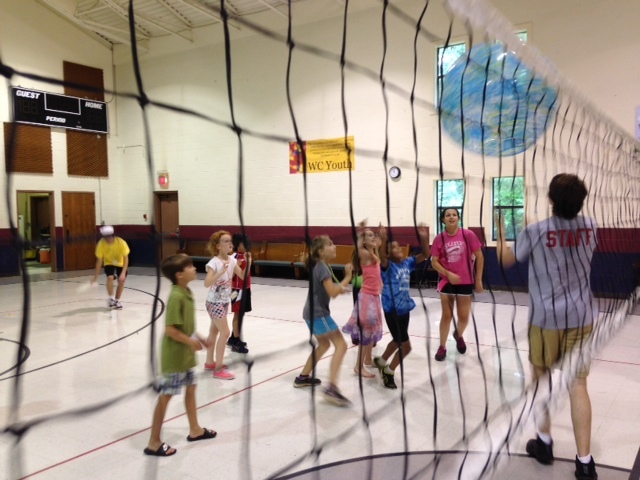 Watching our youth make sure that even the smallest of kids gets to hit the big ball in beach ball volleyball. 4. 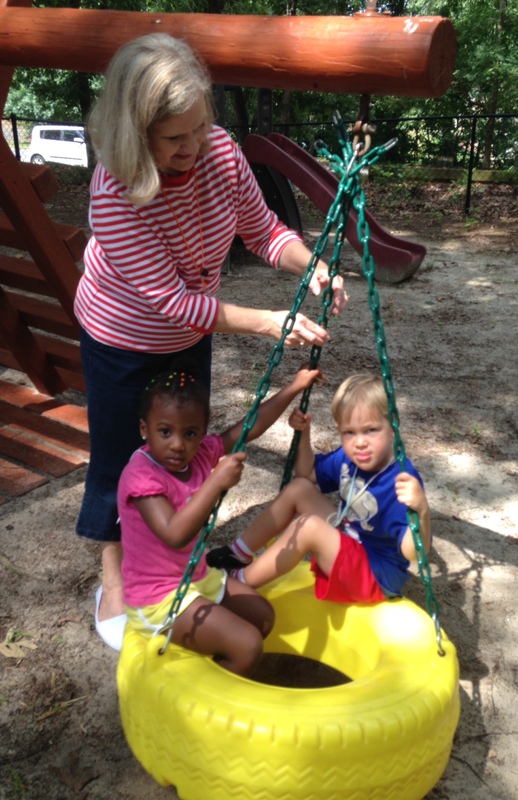 Meeting a young Mama who is dropping off her preschooler while holding an infant on her hip…fearful of leaving her little man for the first time, but knowing he is safe with us. 5. Watching two youth guys lead a group of ten 3rd grade boys with grace, kindness, and joy. 6. The beach party at the end of the week with hot dogs (halved hot dogs for the kids so to avoid waste) and an inflatable, dual water slide AFTER the kids sang the VBS songs with motions and fun. Bumping elbows with old friends and watching old friends meet new ones to welcome new families into the mix. 7. Sharing resources with other area Atlanta churches. 8. A gifted dad who built two, huge wooden lifeguard stands that were shared with another church. 9. 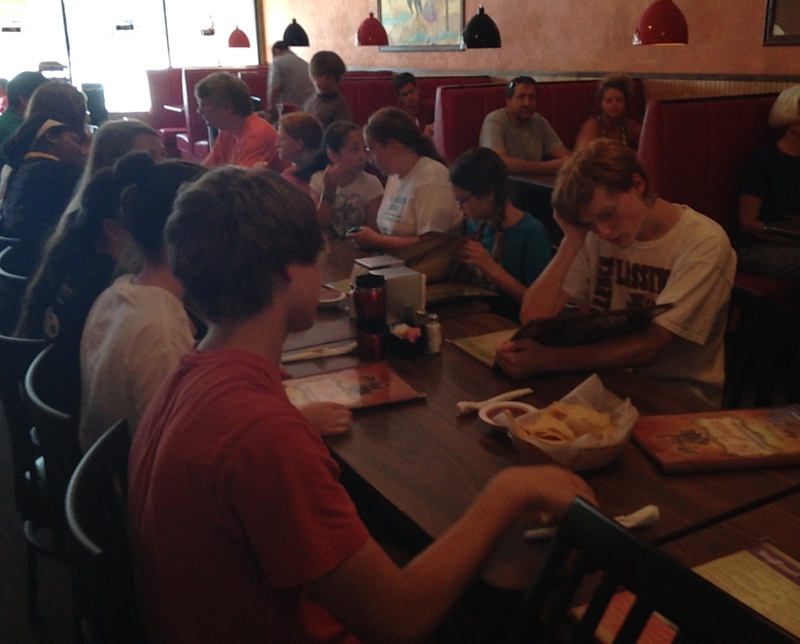 Lunch at the local Mexican restaurant with all our youth volunteers on Wednesday after VBS. 10. Hearing the squeals of delight as Daddies played with their kids on the waterslide at the Friday night beach party. 11. Four young boys who publicly decided to follow Jesus. 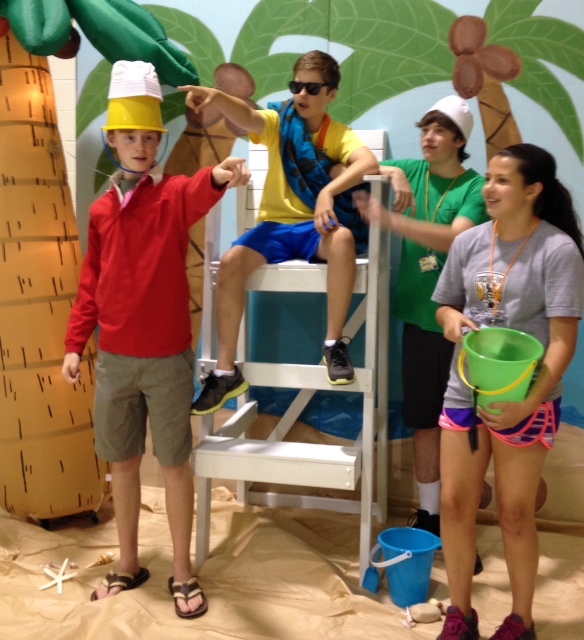 Sharing Jesus is why we offer Vacation Bible School….and it’s why our team does what it does every year. 12. We chose a VBS that shared Jesus every single day of the week…Jesus came as a baby on day one and is coming back on day five. You’d think this would be a given, yet it is not. Sharing Jesus is why we offer VBS…he can’t be talked about only on decision day. I look for a curriculum that will equip our volunteers to share Jesus. If we can learn to do it at VBS, we’ll be more likely to do it in our daily lives. 13. Watching the multiple sets of grandparents who not only volunteered in very visible areas, but they brought their grandkids every single day. These were the Christian Soldiers of the week for me. By the end of the week, I could tell they were exhausted, but their faithfulness to serving the Lord AND having their grandchildren see it, were legacies of faith that could only be accomplished with being sold out Jesus and what was being shared every single day. 14. The donation fish cut outs that were put out and all taken on one Sunday tells me of the commitment my church makes to being sure we do our part well….I think it’s because almost everyone in my church can share that VBS is a part of their faith journey. They get it! A colleague’s husband used the phrase, “VBS is like revival for kids.” I love that perspective. Everyone needs a revival every now and then: the kids and the volunteers. Revival brings new messages and we do things differently for a short period of time than what we usually do on Sundays: snack, the best storytelling, turn on the water hose, decorate like crazy, and dress the part. 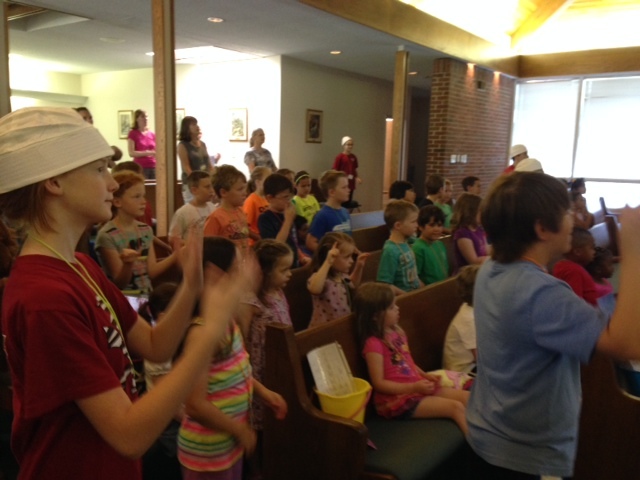 Vacation Bible School is revival, and not just for kids…it’s revival for me a nd all the others, youth and adults. We are reminded in song, experience, energy, and every learning style of how God loves us and how loving Him binds the body of Christ in energy, service, and gifts. I will be getting together with my colleagues from other local churches at our monthly networking group to discuss what we will do next year in just a few short weeks. It’s a time when we share celebrations and hilarious memories. It’s revival and we’re better doing it together.